Pass your commercial driver's written test the FIRST TIME. Prepare for Your CDL Test Questions - Our Cheat Sheets Can HELP! 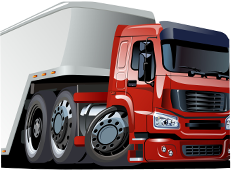 Are you considering a career as a commercial driver? Many people don't realize this, but it's possible to get a commercial driver's license at the age of 18, so long as you work exclusively within your home state. A commercial driver's license, or CDL, is a great way to earn money while you go to college and it can also provide a livelihood for you and your family should you choose it as a career. However, earning your CDL can be difficult - this is where our CDL Cheat Sheet comes into play. Our simple, easy-to-use cheat sheets are a great resource for people who are planning on taking their commercial driver's test. If you are looking for all of the answers to your CDL test questions, look no further than our CDL Cheat Sheet. Think of our cheat sheets as quick-reference guides - they have all of the information that you need to pass your test and nothing else! You don't have to worry about having to dig through paragraph after paragraph of information to find the answer you're looking for - it's all right there, in an easy-to-read, easy-to-use guide! 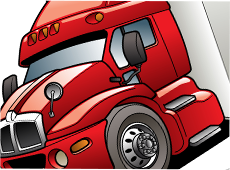 We offer CDL Cheat Sheets for every state in America. These cheat sheets can provide you with the info you'll need to get your commercial license - Class A, B, or C - and any endorsements that you may want as well. Did you know that to operate a vehicle with air brakes or to drive a truck that transports hazardous materials, you have to get special endorsements on top of your standard commercial license? Our CDL Cheat Sheet can help you pass these tests as well! So stop worrying and start "cheating" today! So how do our CDL Cheat Sheets work? How can they help ensure that you'll get your CDL test questions correct? It's simple - you can reference them right before taking your test! All you need is a smartphone or network-enabled tablet, and you can access the cheat sheet of your choice by logging into our website. 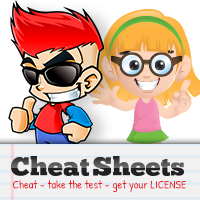 After you buy your Test Cheat Sheet for just $39.95, you'll be given access information to the DMV Test Cheat Sheets website. During your test, you can login and pull up your test cheat sheet as a PDF document for reference. Our CDL test cheat sheet provides you with all of the information you need to pass your test, without providing actual "answers." You can "cheat" without actually cheating! Are You Looking for a Different Cheat Sheet? We also offer DMV Test Cheat Sheets for automobile and motorcycle licenses.